Robert Bradlee enjoys racing on trails at the Trapp Family Lodge in Stowe, Vermont. 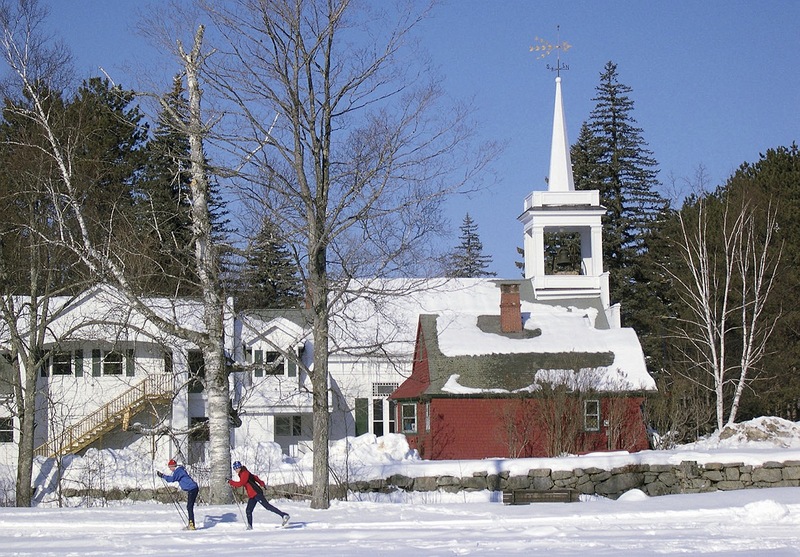 Extensive interconnected trails in and around Jackson, New Hampshire, foster a European-style “inn-to-inn” experience. Harvard’s Nordic ski team head coach Chris City tests waxes with racer Alena Tofte ’13 before the Dartmouth Carnival in Craftsbury, Vermont, last winter. 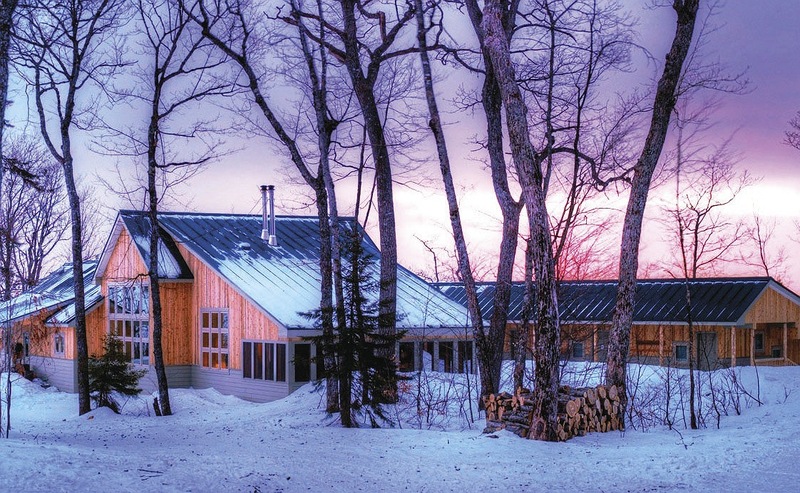 Maine Huts & Trails offers winter sunsets in the wilderness (along with food, hot showers, and convivial company) at the Stratton Brook Hut. 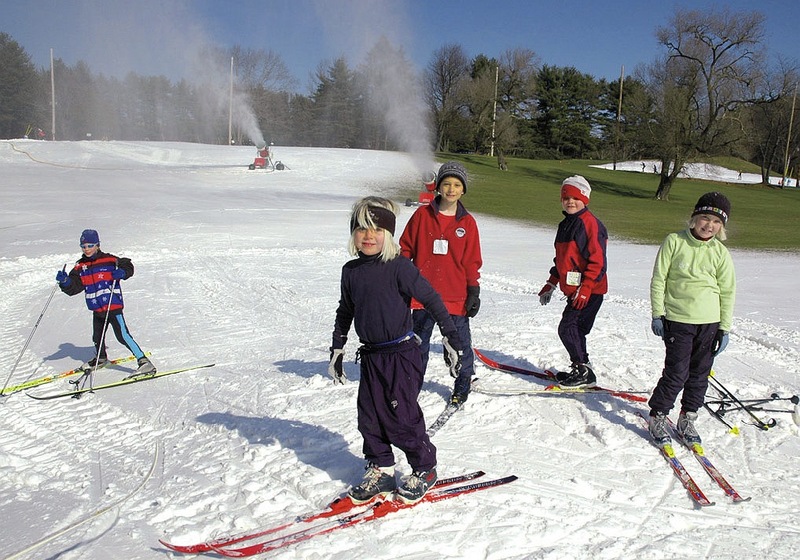 Close to Boston, kids can ski after school at the Weston Ski Track. New England’s terrain offers a wide range of places to ski at all levels, for fun, competition, or both. For multiday trips, Maine Huts & Trails, two hours due north of Portland, offers about 50 miles of groomed trails and four “huts” (more like lodges) with amenities such as meals and hot showers. Also in Maine, the Appalachian Mountain Club oversees more than 80 miles of trails between and around two lodges near Moosehead Lake. 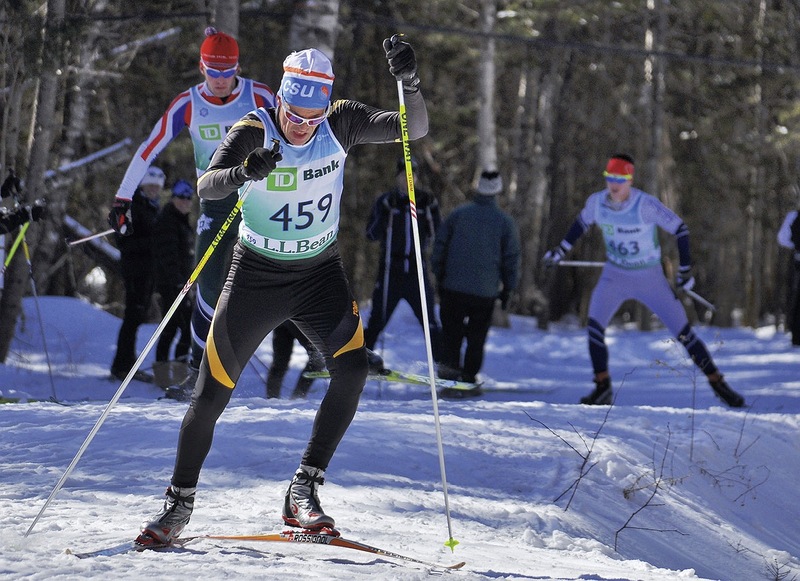 Serious cross-country skiers, as well as newcomers to the sport and families, are also drawn to Vermont’s Craftsbury Outdoor Center in the Northeast Kingdom. Long-range trekkers may choose the Catamount trail (begun in 1984 and completed in 2008), which snakes through Vermont along 300 miles, from the Massachusetts to the Canadian border, while those who want a larger-scale European-style resort that still takes its trails seriously should head to The Trapp Family Lodge, on 2,500 acres in Stowe. City also recommends the integrated series of trails that run in and around the village of Jackson, New Hampshire (just north of Conway), in the White Mountains. Operated by the Jackson Ski Touring Foundation, this system is akin to those in Europe in that it enables skiers to stay at homey inns in town, but easily access connected, longer trails that take them into the wilder landscape—or even to lodgings at a nearby village, the so-called “inn-to-inn” experience. The Ellis River Trail, for example, heads toward Pinkham Notch, with views of Mount Washington, and offers warm places to eat and sleep well at the end of the day. Bradlee is also a top teacher: the U.S. Ski and Snowboard Association named him “best domestic coach” last year. He trains some of the region’s best junior racers (under age 20) through the Cambridge Sports Union, a private club based at the Weston Ski Track. The best of those kids tend to rise up through the Eastern Massachusetts Bill Koch Youth Ski Club (for ages 8 to 13), a program that Bradlee says was built up, from 20 to 200 kids, by another avid Harvard skier, Burbank professor of political economy James Stock (father of Harvard Nordic ski captain Chris Stock ’14 and Dartmouth Nordic skier Corey Stock, who competed in World Cup races last year). Cross-country skiing still requires the combined coordination of kicking and gliding, a weight-shifting, pendulum-like motion, proper timing, and coordination of limbs, to move the body smoothly across snow and ice. To do it well using the classic technique, a person kicks hard, but then slides to make progress, leaning forward from the ankles, with the body weight alternatively placed over each leg/foot. The newer “skating” technique, pioneered by Olympian Bill Koch in the 1970s and commonly accepted by 1982, enables skiers to go about 30 percent faster by using less a striding motion than a lateral transfer of weight from one leg to the other by pushing off the ground, as in roller- or ice skating. “It involves more core strength and, like in swimming, more upper arms and back, because you are also using the poles for a big part of your power,” Bradlee notes. “That’s a big change in the sport. Racers [and now even many enthusiastic recreational skiers] now roller-ski to train all summer because it conditions the arms.” The skating technique is not necessarily equated with racing, and has actually helped more recreational skiers access the sport because many find it easier than the classic style, younger fans want the increased speed it fosters, and there is no need to apply kick wax.